About noon today, Magdalena Scott will troll over to my house in Liberty Ann (who will be snuggly parked in my garage after we are gone) and we'll start heading east toward Ashland, Kentucky and the 4th Annual Dogwood Writer's Conference at Greenbo Lake State Park. This will be my 3rd annual attendance at the conference and Magdalena's first. We are both members of the KYOWA (Kentucky, Ohio, West Virginia) RWA chapter that puts on the event. It's a wonderful small conference and I love going. 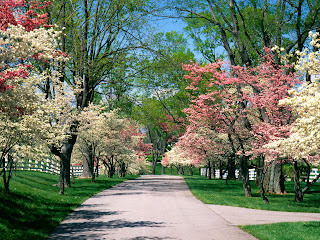 I hope the dogwoods are blooming! I make no bones about saying that I'm a long-distance member of the chapter and the real work behind the scenes goes to the core group who live in the Ashland area. Many kudos to them because they always pull of a top-notch and cozy conference. I won't miss it! Here's a little bit more about the conference, in case you are in the area and interested in popping over. They'll take you at the door, come tomorrow morning, if you are interested! at beautiful Greenbo Lake State Resort Park in eastern Kentucky. Includes Friday night Dinner, Saturday Continental Breakfast, buffet Lunch and all Workshops. $10.00 for Friday night only. Discounted rate for students. Accommodations at the Park at special rates. Phone the park directly for reservations. Key Note Speaker: Bestselling Author Tara Taylor Quinn!